The loud chirping sounds that can be heard during this period are made by a member of the family Cicadidae, relatively large insects which are among the loudest of all insects in the world, sometimes producing sound levels of up to 120 dB! One should not listen to these artists at close range, because our ears are not up to such levels. In practice the insects are difficult to locate in the wild, because the sound seems to come from a different location as one perceives. Only the males are noisy, though, because this is their way of advertising their superiority to the ladies. After the female makes her choice and is fertilized by the lucky one, she will attach her eggs to the bark of a twig. After hatching the larvae, called nymphs, will drop to the ground and dig themselves in. They will stay underground for several years (up to even 17 years in the case of some North American species). There they will feed on sap extracted from plant roots. Finally, they will emerge and molt into a flying adult. I was lucky enough to encounter the end result of such a molting event, which I would like to share with you. 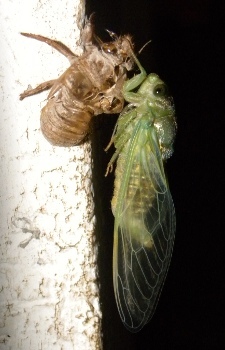 The newly emerged cicada was still unrolling itself in preparation for the culmination of its life: reproduction!